Gertrude Caroline Ederle (October 23, 1905 – November 30, 2003) was an American competition swimmer, Olympic champion, and former world record-holder in five events. On August 6, 1926, she became the first woman to swim across the English Channel. Among other nicknames, the press sometimes called her "Queen of the Waves." Gertrude Ederle was born on October 29 1905 in Manhattan, New York City. She was the third of six children and the daughter of German immigrants, Gertrude Anna Haberstroh and Henry Ederle. According to a biography of Ederle, America's Girl, her father ran a butcher shop on Amsterdam Avenue in Manhattan. Her father taught her to swim in Highlands, New Jersey, where the family owned a summer cottage. That wasn't the only advantage of belonging to the WSA. The American crawl, a variation of the Australian crawl, was developed at the WSA by Louis Handley. According to America's Girl, "Handley thought the Australian crawl, in which swimmers did three kicks and then turned on their side to take a breath and do a scissors kick, could be improved ... The finished product – and its eight-beat variation, which Ederle would use – became the American crawl, and Handley was its proud father." Along with Handley, Epstein made New York female swimmers a force to be reckoned with. Ederle joined the club when she was only twelve. The same year, she set her first world record in the 880 yard freestyle, becoming the youngest world record holder in swimming. She set eight more world records after that, seven of them in 1922 at Brighton Beach. In total, Ederle held 29 US national and world records from 1921 until 1925. In 1925, Ederle turned professional. The same year she swam the 22 miles from Battery Park to Sandy Hook in 7 hours and 11 minutes, a record time which stood for 81 years before being broken by Australian swimmer Tammy van Wisse. 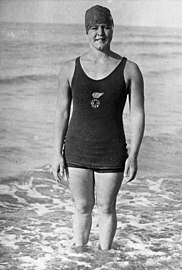 Ederle's nephew Bob later described his aunt's swim as a "midnight frolic" and a "warm-up" for her later swim across the English channel. The Women's Swimming Association sponsored Helen Wainwright and Trudy for an attempt at swimming the Channel. Helen Wainwright pulled out at the last minute because of an injury, but Trudy decided to go to France on her own. She trained with Jabez Wolffe, a swimmer who had attempted to swim the Channel 22 times. During the training, Wolffe continually tried to slow Trudy's pace, saying that she would never last at that speed. The training with Wolffe did not go well. In her first attempt at the Channel on August 18, 1925, Trudy was disqualified when Wolffe ordered another swimmer (who was keeping her company in the water), Ishak Helmy, to recover her from the water. According to Trudy and other witnesses, she was not "drowning" but resting, floating face-down. Trudy bitterly disagreed with Wolffe's decision. Wolffe had commented that women may not be capable of swimming the channel and it was speculated that he did not want Ederle to succeed. 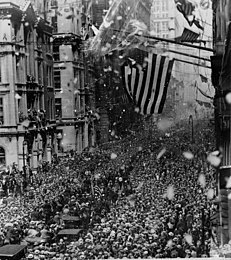 When Ederle returned home, she was greeted with a ticker-tape parade in Manhattan. More than two million people lined the streets of the parade route to cheer her. She made an arrangement with Edward L. Hyman to make a personal appearance at the Brooklyn Mark Strand, and she was paid an amount far greater than they had ever paid an individual performer prior. Subsequently, she went on to play herself in a movie (Swim Girl, Swim starring Bebe Daniels) and tour the vaudeville circuit, including later Billy Rose's Aquacade. She met President Coolidge and had a song and a dance step named for her. Her manager, Dudley Field Malone, was not able to capitalize on her notoriety, so Ederle's career in vaudeville wasn't a huge financial success. The Great Depression also diminished her financial rewards. A fall down the steps of her apartment building in 1933 twisted her spine and left her bedridden for several years, but she recovered well enough to appear at the 1939 New York World's Fair. She had poor hearing since childhood due to measles, and by the 1940s she was almost completely deaf. Aside from her time in Vaudeville, Trudy taught swimming to deaf children. She never married and she was living in an old peoples home in 2001. She died on November 30, 2003, in Wyckoff, New Jersey, at the age of 98. She was interred in the Woodlawn Cemetery in The Bronx, New York City. Ederle was inducted into the International Swimming Hall of Fame as an "Honor Swimmer" in 1965. She was inducted into the National Women's Hall of Fame in 2003. A film adaptation, "Young Woman and the Sea" based on the book of the same name by Glenn Stout, produced by Jerry Bruckheimer with a screenplay by Jeff Nathanson, was set up at Paramount Pictures in 2015 and remains in development . ^ a b Severo, Richard (December 1, 2003). "Gertrude Ederle, the First Woman to Swim Across the English Channel, Dies at 98". New York Times. Retrieved August 11, 2009. Gertrude Ederle, who was called America's best girl by President Calvin Coolidge in 1926 after she became the first woman to swim across the English Channel. She was 98 when she passed away. 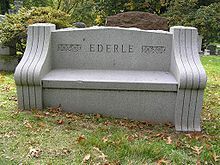 ^ "Ederle, Gertrude Caroline ("Trudy"; "Gertie") - Dictionary definition of Ederle, Gertrude Caroline ("Trudy"; "Gertie") - Encyclopedia.com: FREE online dictionary". www.encyclopedia.com. Retrieved March 21, 2018. ^ Gertrude Ederle becomes first woman to swim English Channel. History.com. Retrieved on May 20, 2014. ^ a b c Sports-Reference.com, Olympic Sports, Athletes, Trudy Ederle Archived April 24, 2014, at the Wayback Machine. Retrieved March 16, 2015. ^ a b International Swimming Hall of Fame, Honorees, Gertrude Ederle (USA). Retrieved on March 16, 2015. ^ a b The Two River Times Archived October 29, 2013, at the Wayback Machine. Trtnj.com. Retrieved on May 20, 2014. ^ a b Mortimer, Gavin (April 26, 2008). "When Gertrude Ederle turned the tide". ISSN 0307-1235. Retrieved August 6, 2018. ^ "The history of goggles" (PDF). ishof.org. International Swimming Hall of Fame. Archived from the original (PDF) on November 23, 2010. Retrieved March 21, 2018. ^ Ferguson, Lee. "Developments of Screen and Stage Shows Traced in Career of E. L. Hyman", Motion Picture News, New York, 7 January 1928. Retrieved on 13 June 2018. ^ Swimmers Brave Chill For NY-NJ Course « CBS New York. Newyork.cbslocal.com (October 24, 2010). Retrieved on May 20, 2014. ^ Girls swimming: Charlotte Samuels of Ridgewood featured in 'Faces in the Crowd' – NJ.com. Highschoolsports.nj.com. Retrieved on May 20, 2014. ^ Gertrude Ederle Recreation Center : NYC Parks. Nycgovparks.org. Retrieved on May 20, 2014. ^ BBC Radio 4 – Afternoon Drama, The Great Swim. Bbc.co.uk (January 23, 2012). Retrieved on May 20, 2014.